Took a while to get it looking okay, should've made the outside of the heart white, nevermind. 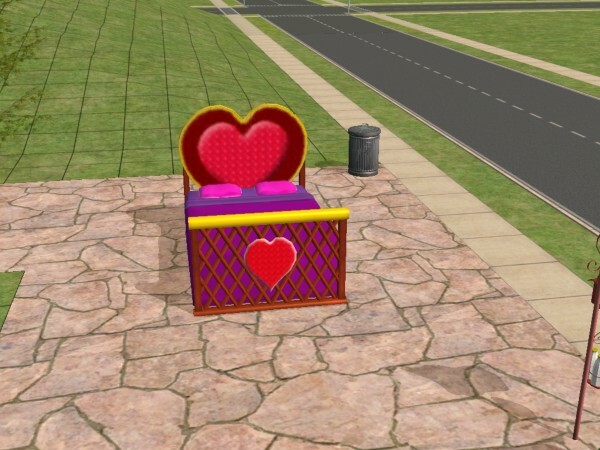 This is my version of the Sims 1 Lovebed. Should be compatible with all ep's, cloned from the Soma sleep well. Polycount for the frame is 2076 faces, 2756 vertices. All I did to the bedding was to slightly resize it. The bedding is included with the zip. Enjoy, and any problems, please post them here. You may re-colour, distribute this file freely or do what you will with it, but no hosting on paysites, it must remain free.